ATLANTA — Tiffany Hayes had 18 points and the Atlanta Dream held off a late rally to beat the Phoenix Mercury 76-70 on Sunday. The Dream (9-9) opened the game on an 8-0 run and reached their largest lead at 62-39 on Hayes’ jumper with 4:28 left in the third quarter. Leilani Mitchell’s 3-pointer with 47.3 seconds left closed the deficit to 73-68 for the Mercury (14-6). Elizabeth Williams made two free throws with 25.6 seconds left and Hayes split a pair with 19.4 seconds left to help the Dream hold on. Renee Montgomery and Brittney Sykes added 13 points each, and Elizabeth Williams and Angel McCoughtry each scored 10 for Atlanta. 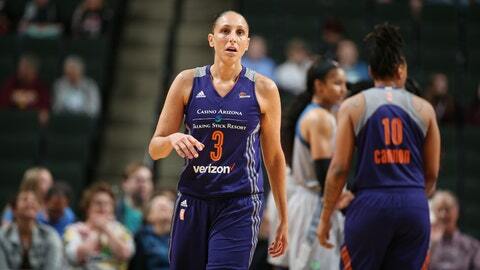 Diana Taurasi scored 19, Brittney Griner added 18 and Mitchell 10 for the Mercury. Sancho Lyttle missed the game with a knee injury.